•A 46-year-old fisherman and Vietnam veteran presented with a recurrent rash on his arms and legs and a painful, swollen area on his left leg of several days’ duration. The rash had been a problem for about two years and was treated with several courses of antibiotics for cellulitis. The patient reported that for the past two years his skin had been prone to blister and tear with minor trauma and that at times his urine appeared to be dark reddish in color. On examination, he had a slight fever and an area of cellulitis on his left leg. His face was erythematous. 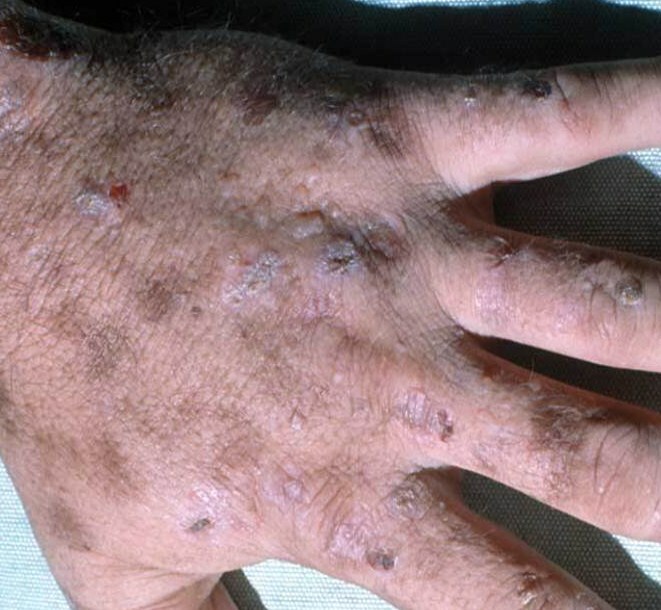 On his hands, arms, and legs were vesicles and small bullae, some crusted lesions, and hypopigmented and hyperpigmented macules. What is the most important next step in diagnosis? D, relationship with hepatitis c and porphyria cutanea tarda..
PCT is due to a defective enzyme (uroporphyrinogen decarboxylase) in liver . ( the enzyme is involved in hem synthesis). PCT begins in mid-adult life especially after exposure to substances that increase the production of porphyrins (precursors of haem) in the liver such as alcohol, estrogen e.g. oral contraceptive, hormone replacement or liver disease. Clinical features include Sores (erosions) following relatively minor injuries, Fluid filled blisters (vesicles and bullae) and Increased sensitivity to the sun . If asked on the exam, consider the diagnosis of Hepatitis C infection ( important association). Use tanning creams in sun and avoid sun in acute flare. VA recognizes Veterans’ porphyria cutanea tarda (PCT) as associated with exposure to Agent Orange and other herbicides during military service when it appears within one year of exposure to a degree of at least 10% disabling by VA’s rating regulations. I would love to get the real correct answer to this… As the real diagnosis everyone can guess is PCT, I would go with D as the next step due to trelationship of hep… Since that would be serious. And possibly alter the course of treatment. Why waste time on a skin biopsy in this case? ?